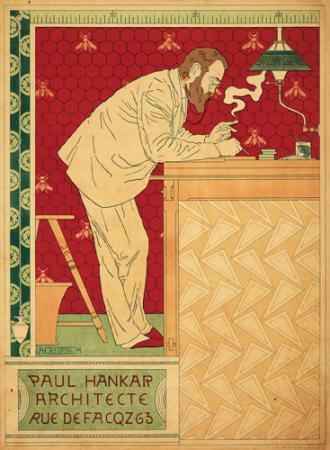 Considered one of the best Belgian architects specializing in Art Nouveau, Paul Hankar often collaborated with Adolphe Crespin, who was a master of interior design. This poster is a perfect balance of their two styles. Paul Hankar was committed to reinterpreting time-honored traditions in his modern architecture and design. For example, the principal subject, positioned just right, is interpreted in a very modern style. There are many details in this poster that are chosen with such pleasure, and arranged with such taste and tact, that far from removing importance from the principal subject he lends it more value, creating a particular atmosphere. For example, Hankar’s chair and footstool with woven leather straps mix naturalistic rusticity and historical styles to create something new. The lantern, which came from Hankar’s townhouse in Brussels, is a similar combination. The wrought iron was manipulated to resemble plantlike tendrils extending from each corner; these natural forms were then paired with four flattened shapes evoking Flemish Renaissance strap work. The warm and vivid coloring further adds to the merit of this print which remains, in my opinion, the best of Crespin. Paul Hankar Architecte, by Crespin, is one of the posters from the turn-of-the-century "Masters of the Poster" series, which consists of 256 of the best posters of the Belle Epoque. And as you can see, it deserves to be there.